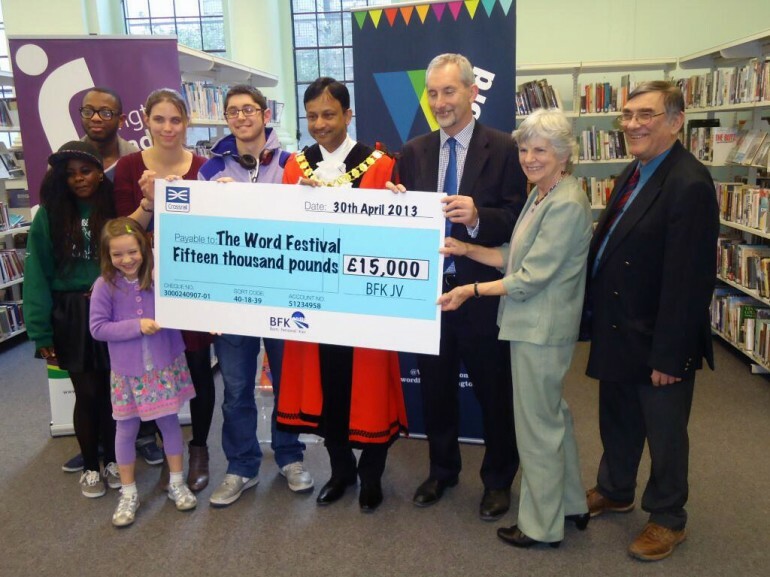 Crossrail helps fund Islington’s innovative ‘Word Festival 2013’ - Crossrail . For information about the Elizabeth line please visit the Transport for London website. A £15,000 donation through Crossrail’s Community Investment Programme from contractor BFK has enabled Islington’s ground-breaking ‘Word Festival’ to take place for the second year running. The Word Festival runs until the 31st May, with more than 50 events taking place at some of Islington’s most inspiring landmarks including Arsenal’s Emirates Stadium and the former Astoria and Rainbow Theatre in Finsbury Park, famous for hosting legendary concerts by artists including Jimmi Hendrix, Bob Marley, and The Who. There will be creative writing workshops with Birkbeck University and Mills & Boon, Bollywood Punch and Judy shows, 100 Word Plays and Secret Radio Plays. A showcase of six brilliant new plays by professional and aspiring writers at Highbury Fields, a Spring Ball (a ‘tea dance with a difference’) at Islington’s Assembly Hall and reading ‘flash mobs’ are further highlights. Crossrail contractor BFK, who is carrying out works for the new Crossrail Farringdon station, has made the donation as part of the Crossrail Community Investment Programme, which requires contractors delivering Crossrail works to support the communities in which they are working. Their donation has helped secure further support from the Arts Council and Islington UNISON. Islington Council's executive member for health and wellbeing, Councillor Janet Burgess said: "The Word Festival is an important part of our ‘Islington Reads’ programme, focusing on how we can help residents get jobs, skills and training through the promotion of reading. With so many different types of events going on across the borough in May, there's something to interest everyone - whether you're looking for a free family outing or wanting to brush up on your poetry skills. I'm sure this year's festival will be as popular as ever, so I'd urge residents not to delay and start booking their places for events."